“You’re not getting out of N, are you?” they asked, perhaps anxious that I’d no longer be able to help them with their Micro-Trains coupler problems. No, I’m not getting out of N. I’m getting into a new modelling project, and HO scale happens to be the easiest way to do it. Used HO scale is plentiful and cheap. The going rate for a good used Micro-Trains N scale boxcar is about $10. 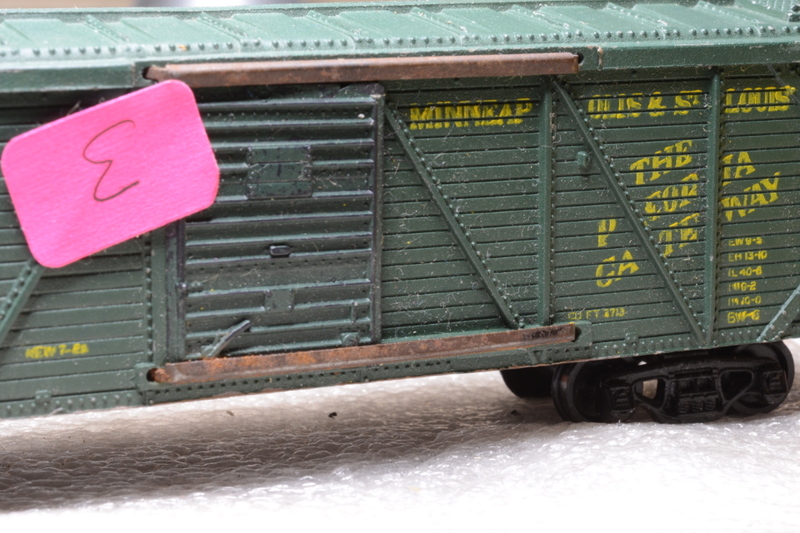 For this project, I found eight HO scale boxcars for $3-5 apiece. One of them even had Kadee couplers already installed. For the ones that didn’t, I purchased new-in-the-envelope Kadees for a buck per car. Compared to N scale, couplers are easy. Most of the cars I picked up have coupler pockets molded into the chassis. Pop off the lid, discard the manufacturer’s horn-hook coupler, and a Kadee #5 drops right in. At worst, you drill and tap for a 2-56 screw to hold it together. There’s no need for the kind of dark magic we use for N scale couplers. The variety is astonishing. N scale is just now getting the kind of freight-car variety that HO scalers have enjoyed for years. You want a Milwaukee rib-side car? A 50-foot Pennsy wagon-top? A wood-sheathed milk reefer? No problem. There’s more history. Search all you want, but you won’t find N scale items older than the mid-1960s, and they’ll have a plastic construction not unlike what’s being made today. HO scale has a much longer history; dig deep enough and you’ll find items made of die-cast zinc, printed-and-scribed cardboard, or milled wood. So, I have the cars I need for this project, and most of the track. I still need a locomotive, but I have some leads on that. The electronics will be similar to the Library Project’s, with some additional refinements to handle turnouts and back-and-forth operation. With any luck, I should have something to show by fall. In the meantime, I’m working on N scale projects too, so don’t worry.